And what do you do, Lux? I am the mid-day on-air personality on 105.7 The Point! You’re the only lady on the Point’s airwaves, correct? I am. I am the only female which is a challenge and a blessing. It definitely allows me to tolerate lots. Plus it allows me to just kinda be myself, because there is no one else that i’m compared to, which is nice. How did you know that you really wanted to be in radio? I was in second grade. My show and tell project was a recorder and microphone. My mom and I came up with a bunch of slogans and I taught people how to voice-overs. Most people brought in their puppies or trophys from gymnastics. And I was spouting off slogans. I went to college thinking I was going to do film. But I needed work, so I went to a job fair. The only job that was not work-study was at a radio station, KWKJ 98.5 & KOKO 1450. They had a full stack of already filled out applications and one left. I literally wrote in the corner of it ‘will work for peanuts’ filled the thing out, sent it in. With no radio experience, they hired me to be part-time weekends on-air. I liked that. I thought it was fun, but it didn’t make me a lot of money. When I moved home to go to Webster – because they have such a great film program – I was a receptionist at a hair salon. I put out on myspace (yes, myspace) that I was looking for a job. Matthew [promotions director] replied to me, through mutual myspace friends, about a 5-10 hours a week position in promotions for The Point. I thought, sure, why not? I took the job and two weeks later I’m walking around the building when Rizzuto mentions my pervious radio work and asked if I wanted to be on air. I said YES! I started on Friday nights, and I’ve been doing it ever since. I feel like radio chose me. I didn’t necessarily choose it, but there are definitely lots of things leading up to it. Favorite thing about working in radio? The perks. We are spoiled rotten. I can’t believe they pay me to go to Lollapolooza. I can’t say that I’ve never thought of this – so the answer is easy. Everything In It’s Right Place by Radiohead. It’s very soothing, and I just love the message that everything is in it’s right place. It the only place it’s gonna be, so it’s clearly in the right place. I wish I got to play more Radiohead on the station. But I do understand that my listeners don’t love it. The color red. It’s been huge on the runways. And I just got this sheer red dress I’ve been wearing like crazy. I also love wedge heels and boots. Jeffrey Campbell – you cannot go wrong. I own nine pairs of Jeffrey Campbell shoes. The two sisters who own Wildfox. They are always super fashion forward, gorgeous, young sisters. Celebrity wise – I’d go with Nicole Richie. She is on it. Her new line is really gorgeous. She will also sometimes wear something wacky and out there. She used to do it a whole lot, and I just liked that. What are your thoughts on fashion in St. Louis? When I get up in the morning, or if I have to get dressed up for an event, it’s a creative way for me to express myself. I like being different, I like being out there, I like exploring the trends and being fashion forward. I get a whole lot of inspiration from a few other girls in STL. I’ve walked in a few shows for Miss Ohio Vintage – and I love her stuff. I think people have a very mid-west attitude. It’s the idea that sweatpants and sweatshirts are okay in public. Some days I put on a hoodie, but it’s more fun to explore. I think STL is making it’s way there. I love to eat St. Louis food. I live in what I like to call the trifecta of fattening things I shouldn’t eat. LeGrands deli, Mom’s deli, and Ted Drewes. It’s a triangle surrounding my neighborhood. I also live close to Farmhaus & Pizza-A-Go-Go. All of those are non-chain, St. Louis only eateries. STL has such great food. Obviously I go to a lot of concerts. I love concerts. I think it’s so amazing that The Pageant was named a top concert venue, recently. It’s an amazing place. I feel that way about all the venues in STL, like The Firebird and Off Broadway – I think they are so great. To follow more of what Lux is wearing, saying, eating, etc. 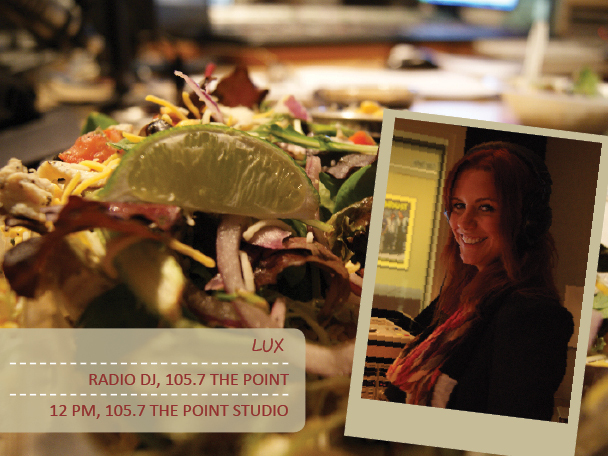 you can follow her @lux1057, on Facebook, or here! Love this. Jenn Cloud directed me here – I am officially obsessed. Added to my RSS! Great post & blog ladies! And Lux is gorgeous inside and out – great interview!